Description: This is the fourth overall album of One For All, the super hard-bop band featuring Eric Alexander and other talented New York musicians, and their debut album from the Japanese independent label Venus Records. 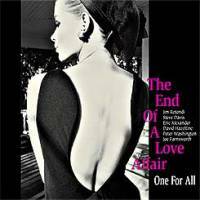 One of the few contemporary groups that play straight-ahead, hard bop jazz in the 21st century, One For All opens this album with blazingly fast "The End of a Love Affair." The thick sound of three horns and steady and lively beat of drummer Joe Farnsworth are the highlights of this attractive tune. The mixture of standards and original compositions work well, and David Hazeltine's "How Are You?" and Eric Alexander's "Shinjuku Walts" are particularly strong. Recorded in March 2001 in New York; Venus Hyper Magnum 24-bit mastering. Special gate-fold paper sleeve edition. Swing Journal Gold Disc.